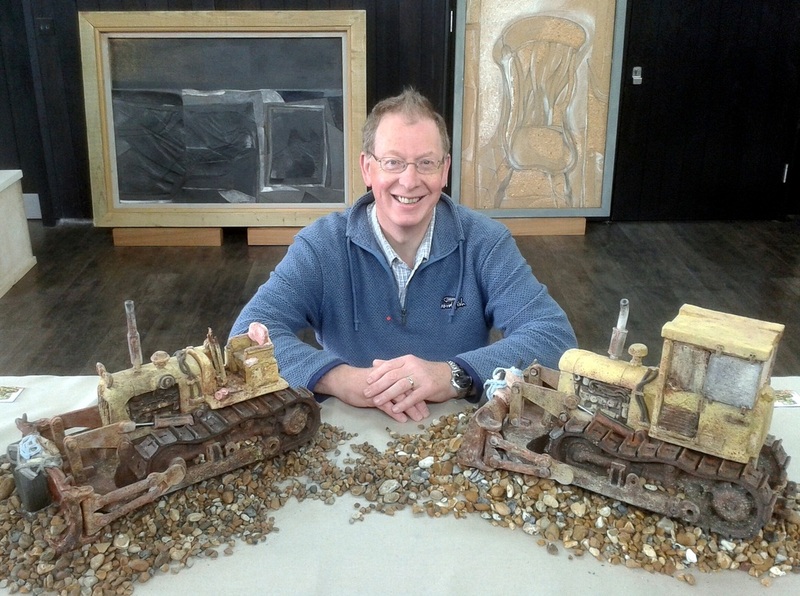 Andrew Topliss’ “Hastings Beach Tractor” sculptures are large enough to impose their mechanical presence on the viewer, but not designed to be accurate reproductions of the original machines. Rather they are richly layered, carved, modelled and painted expressions of mechanical eccentricity and structural entropy sculpted in clay. The inspiration for this series of ceramic sculptures came from Andrew’s photographs and drawings of these tractors, originally manufactured by Marshall’s of Gainsborough in Lincolnshire between 1972 and 1986. Now found on the shingle beach at Hastings, East Sussex, England, and used by local fishermen to push the 10 meter wood or steel boats into the sea and later haul them back onto the shore, these battered and rusty relics are rich in pathos, character and symbolism. While walking the local fishing beach called the “Stade” at Hastings, Andrew initially intended to research the fishing boats hauled up on the shingle beach. As he photographed the boats, he became increasingly aware of various types of Crawler Tractors parked all over the beach, some in working order, some broken up, some reduced to metallic skeletal remains embedded in the shingle. Dating from the 1970’s, these geriatric machines, patched up and adapted by the fishermen to push their boats across the pebble beach into the sea, appeared to Andrew like a bunch of old-timers, coaxed back into the workplace, long after they should have retired gracefully. Far from the agricultural land that they used to work, these rugged, rickety, old-stagers that had seen better days were suffering the effects of sea-spray, corrosion and vandalism. Some patched up with plywood, others cannibalised for spare parts, held together with wire and string and partly covered in canvas; they provided very rich veins of form, outline, surface texture and colour to experiment with and build as clay sculptures. Andrew has always been interested in mechanical elements and clearly remembers as an 8 year old visiting his grandfather who worked at the Victorian steam pumping station at Claymills near Burton, Staffordshire. “The manner in which individual fishermen had adapted tractors for work on the beach in order to maneuver their craft, was a study in itself. There seemed no end to the ingenious and completely mad ways that old car and lorry tires had been roped and chained onto the front of the bulldozer blades to prevent damage to the bows of their wood and metal boats. All kinds of extra cushioning materials had been scavenged, brought and wrapped around, softening the ad-hoc welding of exposed metal parts, giving the appearance of ridiculous, giant bird’s nests, crammed between tractor blades and boat bows”. Andrew also writes, “For the sheer fun, exuberance and outstanding modelling skills used, sculpting ceramic engines and mechanical parts, it’s hard to beat the work of American Ceramicist John Brickels, especially his re-imagined scrap metal toy pedal cars complete with supercharged engines, undercarriages and tires, which are amazing”. The words of French painter Fernand Leger used while describing the novel sight of industrial refuse in the landscape in a series of his paintings, seem very apt here. He describes the, “shock of the juxtapositioned forms and mechanical elements, the tons of abandoned machines, with flowers cropping up from within and birds perching on top of them”. Andrew writes, “The motor vehicles, sculpted from old car parts by the German artist Martin Otto Lambert Heukeshoven have also been inspiration with regard to creating, many different qualities of surfaces, types of chassis and the manner in which sheet metal seams are joined together, but reinterpreted in clay rather than metal”. Andrew has captured the essence of these mechanical beasts without being sentimental. He recognized their weathered beauty as well as their historical importance as markers of time. His modelling skills and command of a subtle color palette make these sculptures compelling and a celebration of fine craftsmanship. 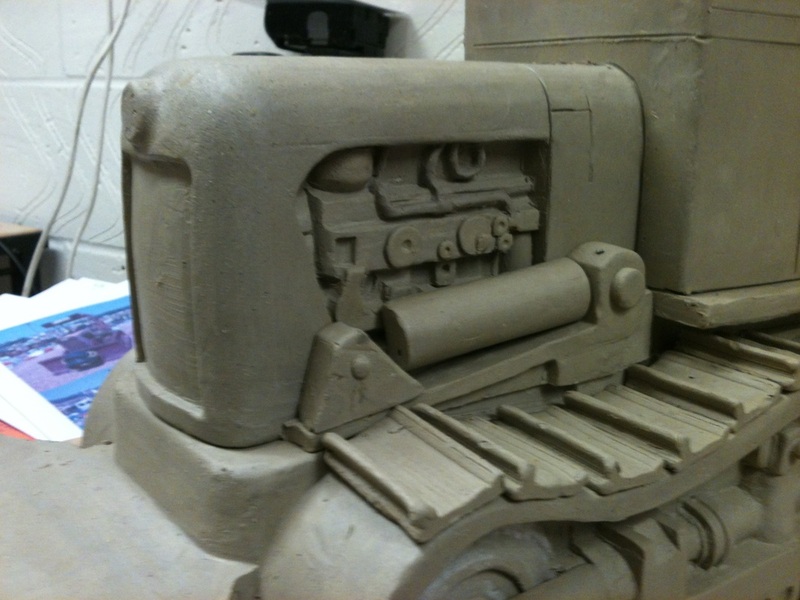 Materials and Techniques used in creating the Hastings Beach Tractors Series. The creative process began with two months of photographic and drawing research to understand and successfully replicate the key mechanical elements to be captured in clay. 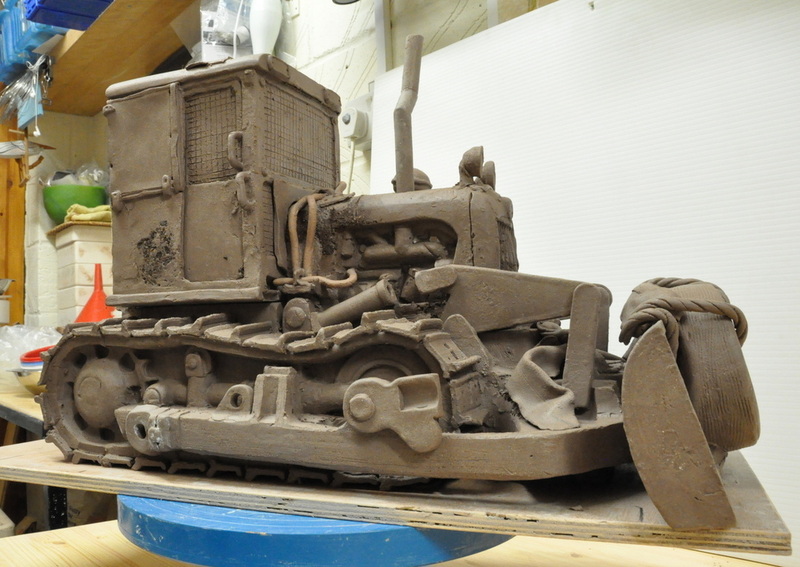 After marking out carving and modelling an original, detailed version of a crawler from solid blocks of clay, Andrew noted where undercuts should be avoided, then dissected this full scale model into its elements of chassis, tracks, cab, engine, blade and tire. These carved sections were then cast as a series of complex plaster press-moulds. In all, ten sets of these moulds were made to take account of the six different versions of the tractors he decided to produce in the series. 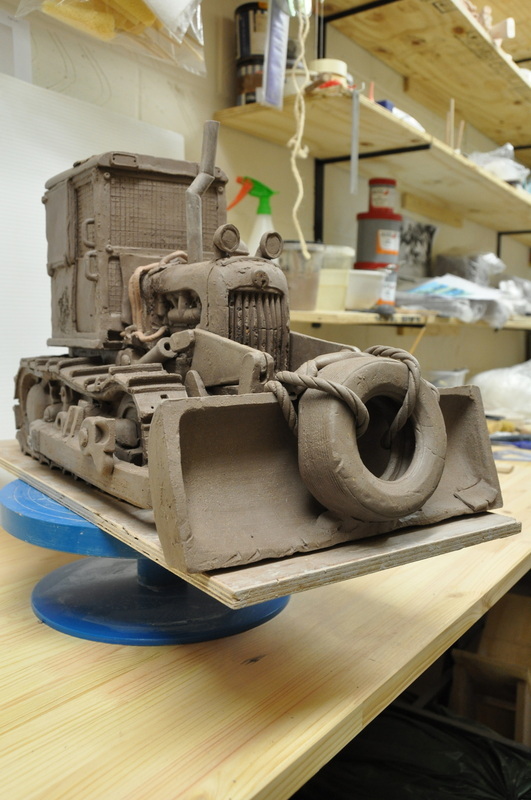 From starting to fill the moulds with clay to adding the individual touches, each tractor took around 40 hours to press-mould, assemble and decorate. Care needed to be taken to hollow out heavy sections with wire ended modelling tools and pierce sections where the layers of clay were too thick, using a thin metal rod to avoid air pockets causing problems in the Bisque firing later. As the cleats (metal plates) on the tracks were too complex to press-mould the first time round, Andrew made a die of the profile he needed and extruded them using a wall mounted clay extruder as long ribbons which he then cut into lengths and glued on individually using a slip made from the main construction clay, but with a spoonful of white powdered wood cellulose added to add extra stickiness. The twisted ropes, steel cables and hydraulic lines were extruded using a hand extruder. For the Tractor Body, Cab, Engine and Blade - Scarva Earthstone ES20 Smooth Textured Crank. For the Tire and the Hydraulic lines - Scarva PF680 Professional Smooth Black. For the Ropes holding the tire to the blade - Scarva ES200 Flaxpaperclay. To avoid thin sections such as the ropes and hydraulic lines cracking, Andrew painted them with emulsion wax resist after fixing and wrapping them in place. This forced the moisture in the clay to migrate back through the thicker sections safely. After a long drying period Andrew placed the tractors and their extra elements in his Nabertherm Top100 electric kiln and fired them to 1100⁰c is higher than a normal Bisque firing as he wanted the pieces to be denser and less absorbent to slips, engobes and glazes so that the colours and textures could be built up in multiple layers. Andrew then painted a thin wash of a local red clay slip followed by washes and splatters of metal oxides (Manganese Dioxide, Red Iron Oxide and Yellow Iron Oxide) using brushes and an old toothbrush, over the lower parts and tracks of the tractor. He then sponged layers of Botz Engobes 9043 Ockergelb (Gold Ochre) and 9042 Hellgelb (Yellow) mixed with some sand into the final layer to create a texture to replicate expanding rust and faded paintwork. Where Andrew wanted to create a glass windscreen effect, he first painted the areas with Scarva coloured Decorating Slips and then brushed Botz 9351 Craquele Transparent over the windscreens to suggest broken, crazed glass. After decoration, Andrew fired the tractors to 1120⁰c in his electric kiln with a long soak of 35 minutes to get the coloured layers to react with each other successfully and enhance the modelled details. The linkages for the blade lifting mechanism were fitted and glued together using an industrial strength epoxy resin and a small piece of aluminium tubing incorporated to suggest the shiny hydraulic piston. The tractors measure approx. 52cmsL x 28cmsW x 32cmsH.